This tutorial will talk about the solution for SBS 2003 partition expanding when running out of disk space in VMware. Download IM-Magic Partition Resizer Server to increase the size of disk partition when has low disk space on SBS 2003 VMware. You can install a virtual machine on Windows SBS 2003, which enables your computer to run in a virtual environment. If disk partition is running out of disk space in SBS 2003 VMware, do you need to reinstall the virtual machine? No! You can use IM-Magic Partition Resizer Server, which works as partition resizing software to reallocate disk space in VMware. This partition software can extend partition, shrink partition and move partition, etc on all Windows Servers. Download, install and launch IM-Magic Partition Resizer Server. Right click a partition that has much free space on SBS 2003 VMware and choose "Resize/Move" option. You need to move the unallocated space close to the partition you want to extend. 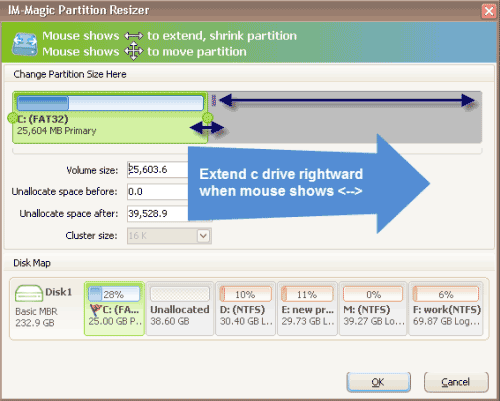 Then, right click this partition and select "Resize/Move". "I have installed Windows Small Business 2003 operating system in VMware on my computer. There is a 160GB hard disk in the VMware and the C drive is running out of disk space. The D drive has 120GB total space with more than 80GB free space left, so I want to squeeze some free space from the D drive. How is it possible to extend C drive space on SBS 2003 VMware?" "I have four 160GB hard disk in RAID 5 array on my SBS 2003 Server. There are three partitions in the RAID 5, but one partition on which operating system is installed is running on low disk space. I am wondering if I can increase the size of system partition. I tried to add another disk to the RAID 5, but it only shows as unallocated space beside the array. 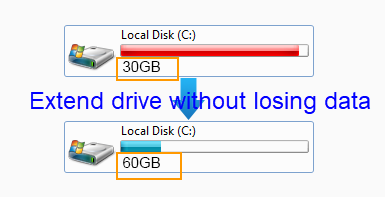 I cannot add the unallocated space to RAID 5 system partition. Can anyone show me the solution?" It is important to look for a secure method to expand system partition if you don't want to hurt the operating system due to partition resizing. The professional partition software enables all Windows Server users to resize hard disk and reallocate disk space in an effective and safe way. This partition software helps expand system partition (C drive) without having any influence on the operating system. By using this software, you can resize C drive without reinstalling system. The partition software is available for disk partition resizing when it works as system partition, boot partition or primary partition. With this partition magic software, you can extend C drive in Windows 2003 R2 VMware and other Windows Server too. The partition software also works on data partition whether it has NTFS or FAT32 file system. You can move free space from any other partition on the same hard disk. Generally speaking, you can move free space from a system partition or another data partition to the partition that is running out of disk space. The software works efficiently which allows you to extend partition without even rebooting your PC. Besides, the software is safe to use. If your computer reboots or turns off due to some other reasons during the partition resizing, it will not cause any damage to the hard disk or data on the disk. You can rebuild RAID 5 in order to resize the array, but you also need to backup all data on the array before rebuilding the array. The partition software can help you resize RAID 5 array without rebuilding and it doesn't touch any data on the array. Instead, this partition software allows you to move free space from other partition on the RAID 5 so as to extend the partition that has low disk space. You can also add a new disk to extend the RAID 5 array. In a word, the partition software works on both basic hard disk and RAID 5 array when you need to perform partition resizing.